So, the kids don't want to eat their vegetables? Maybe it's time to make eating a whole lot more fun. What kid wouldn't love to eat off of a super silly Sharpie funny face plate? 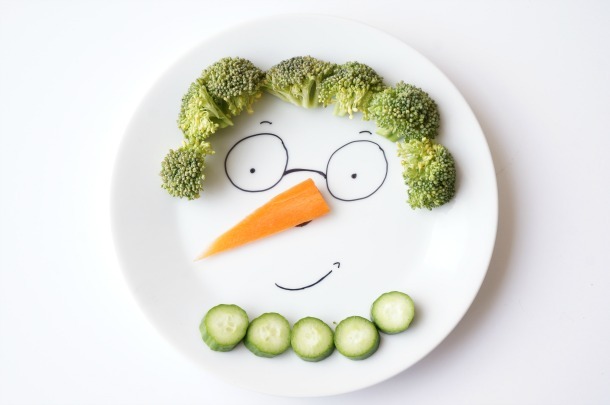 Transform a regular old plate into a silly face plate. The kids can even create their own plate. First thing's first, you need a plate. We picked ours up at IKEA, they cost $2.50 each. I'm sure a plate from the dollar store would work too. The only caveat is that the plate should be a single colour, that way your design will show up nicely and the food will provide all the colour you need. Make certain that your marker is a permanent marker - washable markers will rub off on the food. Start with a plan. These are permanent markers after all! We sketched out some ideas on paper. This gave us that opportunity to try out all sorts of silly faces. Anything goes. Next, it's time to commit. Use the Sharpie to draw the face on the plate. I love the designs my daughters chose. Once the face is drawn, place the plate inside a 400F oven, directly on the rack. Bake for 30 minutes. After 30 minutes, turn the oven off and let the plate cool completely before removing it from the oven. Now it's time for the fun part - the food. 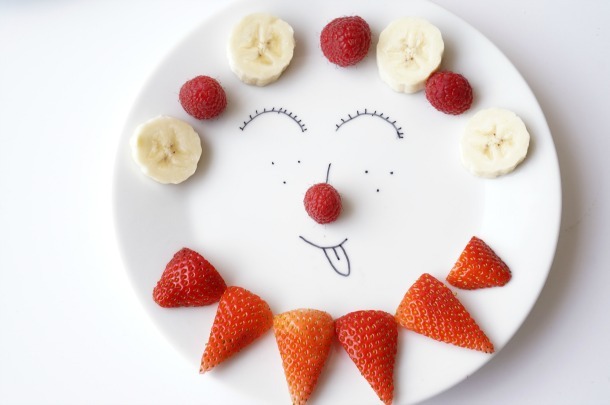 Gather up a wide assortment of fruit and vegetables and decorate the plates. Broccoli hair, raspberry noses - use whatever your kids want. 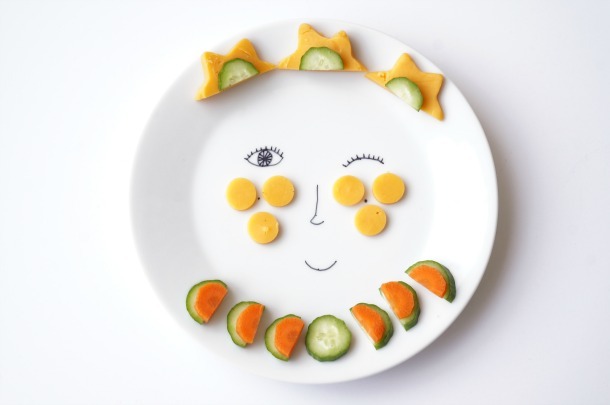 Use a cookie cutter to creatively cut up cheese and larger pieces of fruit and vegetables. The plates can be washed by hand in soapy water. You could try cleaning them in the dishwasher, but I'm not sure how each individual plate will fare. How cute are these plates!? 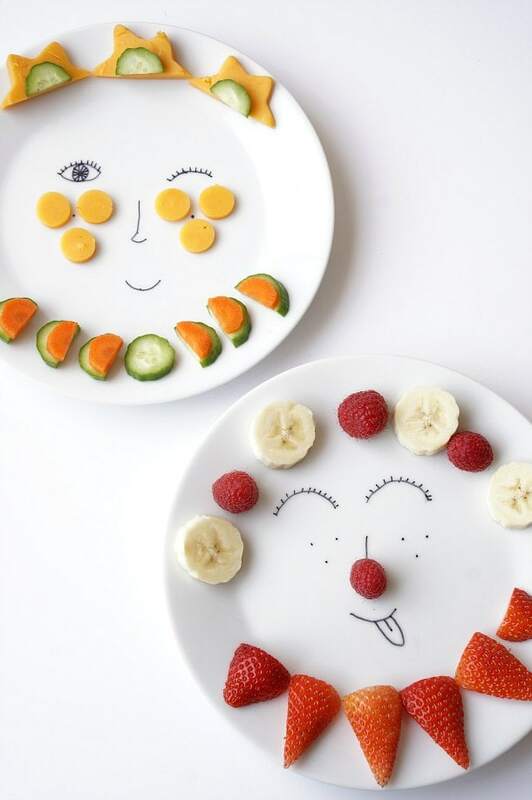 Who could possibly resist eating the fruit and vegetables that decorate these plates? Let your child take ownership of his own design and creation and watch him eat happily. Who said that we shouldn't play with our food? Jen found her love of growing food from her mom, who always had something growing in their suburban backyard garden. She learned that good food can be grown in the smallest of spaces. Nowadays, you will often find Jen and her two daughters in their tiny city garden harvesting vegetables and herbs for the meals they will prepare together. She believes that a child’s food education starts at home. The easiest way to get kids excited about eating new things, is to invite them into the kitchen. Jen is always looking for ways that her kids can get hands on in the kitchen. Whether it’s washing the veggies, mixing the cookie dough or making a simple vinaigrette. There are so many ways to spark a child’s passion for good food. Join Jen as she shares her seasonal, simple, delicious, family friendly recipes…inspired by her family’s trips to the farmers’ market. Discover easy ways to introduce your children to how food is grown, who grows it and how to prepare food that will help them lead healthier and happier lives. You can also find Jen sharing everything that lands on her kitchen counter on her blog Kitchen Counter Chronicles.